Removal? – After an initial consultation, an appointment for your first treatment at our medical spa can be made immediately. Depending on how fresh the tattoo, we may need to postpone the first treatment by a few weeks to give it a chance to heal. Treatments? 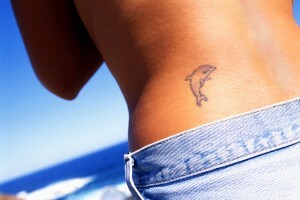 – On average expect between 5-10 treatments to remove your tattoo. If your tattoo is homemade the process to remove it may take less time and pigmentation may break apart easier. Be mindful that a professional tattoo could potentially take more than 10 treatments to remove. How Often? – Normally each session occurs within 6-8 weeks of each other. Skin type is also a determining factor in the frequency of treatments. It is important that we give the skin enough time to heal from the surface down to the dermis layer to heal. Your body will continue to break down the ink following the treatments, which will cause the tattoo to begin the fading process. Pricing? – Many variables are factored in when it comes to pricing such as the size and colors of your tattoo. After your initial consultation where we can exam your tattoo (s) that you would like removed pricing will be discussed. You can still live a life with no regrets, give Veritas Media Spa a call today!